Sounded grim on phone.Hope it clears soon. Yep,looking big for forseeable future.Hope that wind's kinder than it looks. The local was too crazy at low so I went to shitpipe for a look-see expecting nowt. I was surprised to find a clean 2ft left courtesy of the low tide. Out came the omni! Had a seal pup with me for a few waves which was cool but something smelt really ripe. A grim discovery indeed. I've not smelt anything as bad since that dead Fin Whale washed up at Porthtowan! I hope it was not the pup's mum as I saw one a similar age with its mother last week (although they're probably fending for themselves ok now). 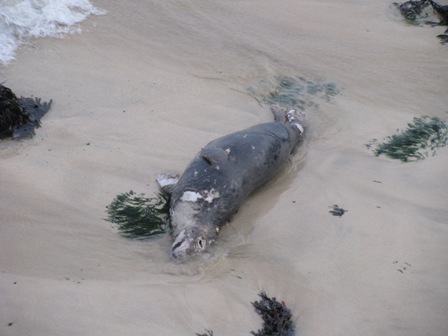 Sad to think that this could have been one of the local seals that I've surfed or snorkelled with over the years. R.I.P. Friday, Saturday and Sunday have a fair bit of promise for Pentewan you know. Something at Chally tomorrow too but I wanna give this chest a bit longer. I'm up to my armpits in brandy butter,but that's just my penchant. Don't know,may have a look at Pentewan tomorrow,or meander down James's way.Sat/Sun/Mon/Tues ad infinitum likewise! That seal looks like it died of old age.Usually they sink to the bottom,but with all that swell. The pups seem to be very early this year.Almost old enough for clubbing. Not enough for Pentewan tomorrow I don't think, but after that looks promising, particularly Sat/Sun. Swell goes well Southerly too so might struggle to get into those northerly nooks. Friday might be alright for the D Spot if the wind behaves. Yeah maybe.You having day off? !Unheard of.Your relatives don't. Anyhow,hope chest's getting better.My mum used to make me stand over the tar barrel at roadworks and inhale heartily. Getting there but awake coughing my balls up last night for an hour. Reckon I'm out of the water until after xmas. 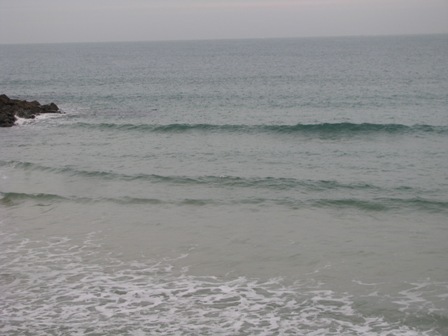 Caught a few dusk peelers on meor yesterday evening with a pod of dolphins feeding about 100m outside. That's nothing.I surfed with this in my head. Now my Christmas is complete. Anyone surfing tomorrow (Friday)? If so, where and when? I'll likely be checking out Pentewan tomorrow - maybe early afternoon. I'm looking at Sun/Mon realistically as have a family do in Exeter tomorrow lunch time. Chest is definitely on the mend. Sunday looking better for P-wan now - might still have a looksy tomorrow. 8am at Pentewan tomorrow then? See you in there - more likely 8.30am+ for me. If you wanted to see a grown man slapping the water with a teatray,yelling,gesticulating and claiming every microride extravagantly,you should have been at P-wan today.If life was like Monsters Inc,we could have powered the Southwest off G' stoke power for a week.